Ferrari's 2019 Formula 1 car has been pitched "in the wrong place aerodynamically" and it will take "a lot of work" to fix that, says 2016 world champion Nico Rosberg. The Italian team has taken a different aerodynamic approach to Mercedes, adopting a lower-drag philosophy compared to its rival in addition to divergence over front-wing concepts following the new-for-2019 aero rules. That has translated into a straightline speed advantage for Ferrari, buts its balance has suffered through the corners and Mercedes has swept to a trio of one-two finishes at the start of the season, the first time that has happened since Williams did so in 1992. Assessing the Chinese Grand Prix on his YouTube channel, ex-Mercedes driver Rosberg said: "Mercedes are big, big favourites at the moment. They're just looking so strong. "Ferrari's just struggling. Ferrari have pitched their car in the wrong place aerodynamically. "They have way too little drag and just way not enough downforce in the corners. "That's where they're losing a lot of time. It's not ideal for the fastest possible lap. "So they're just in the wrong place with their car." Mercedes estimated that Ferrari was gaining as much as half a second on the straights in Bahrain. 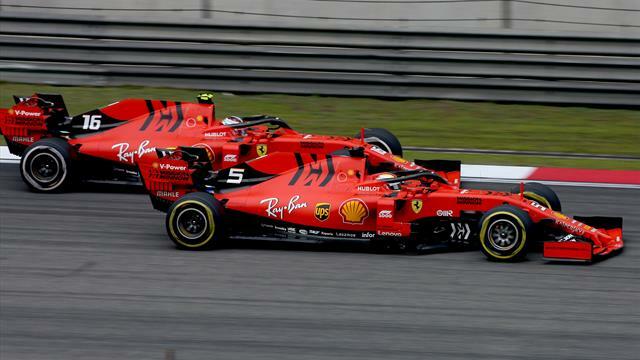 However, in China, which has an ultra-long back straight, Mercedes locked out the front row in qualifying and defeated Ferrari with relative ease in the race. Rosberg believes Ferrari tried to compensate by adding downforce to the rear of the car but was unable to do so effectively. "They were trying this weekend to put on some more rear wing but they didn't have the bigger rear wing they needed," said Rosberg. "They need to produce that but also just putting on rear wing is not an efficient way because it's just a 1:1 'increase downforce, increase drag'. "That's not the way to go. The way to go is to take it from other places in the car, like front wings, endplates. "That's what that really need to focus on now. But that's a lot of work. It's going to take time, it's not great." The next race of the season takes place in two weeks in Azerbaijan, which has an even longer flat-out run from the end of the final sector all the way through to the first corner. However, the middle part of the lap comprises several slow, more traditional street circuit corners. "[Ferrari is] just going to be strong on those tracks with a lot of straights," said Rosberg. "Baku, I'm not really sure. There's so many slow corners they're going to lose out a lot and lots of straights where they're going to gain. "It's very difficult to judge if that's going to be a track where they're going to be ahead. "Let's see. I'd put Mercedes ahead at the moment everywhere, even Barcelona."